Have an egg-cellent time this long-weekend at Port Stephens’ annual Easter Blues& Brews festival. Award winning local craft beer and spirits maker, Murray’s Craft Brewing Co, is putting on a family-friendly show for the senses, running all long-weekend. Groove to FREE blues concerts on Easter Saturday and Easter Sunday. Talented musician, Nano, will help you chillout with Latin tunes on Saturday. And on Easter Sunday, the amazing Blues Bombers will perform their own brand of swing, rock and roll and swamp blues in a dazzling outdoor show. Devour delicious gourmet pizzas and smoky barbecue fare fresh from the wood fired oven, teamed with your favourite brew or wine. Great value $10 Kids Meal Deals - including meal, drink and ice cream – are available all weekend. And kids can have great fun with dedicated activities on Easter Sunday morning, when Murray’s will run a special family fundraising event, Easter Sunday Kids Funday. Kids can enjoy a giant Easter egg hunt, play an interactive Easter game (byo mobile device! ), join the Easter-themed arts and crafts, egg and spoon races, face painting and more - including a VIP visit from the Easter Bunny. Parents are asked to pre pay a $5 donation for each child participating in the morning’s activities, with 100% of proceeds donated to Birubi Surf Life Saving Club and Fingal Bay Surf Life Saving Club. Bookings for kids’ activities are essential and places are limited. 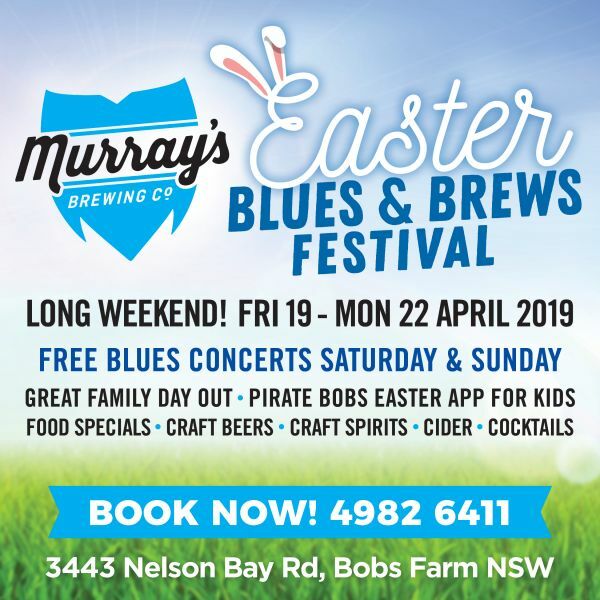 “Join us this Easter and you can enjoy a great family day out plus do some good for the local community at the same time,” said Brewery owner, Murray Howe. “Hot Cross Bun Beer is one of our most requested specialty brews and we’re going the whole bunny and offering up a NEW delicious White Chocolate Easter Egg Beer too. It’s going to be amazing family fun,” says Brewery owner, Murray Howe. A Brewery Bus is available on Easter Saturday and Sunday. Bookings are essential. Murray’s Brewery’s large undercover facilities will ensure that most events will proceed – rain, hail or shine.